Vancouver: Jonathan Seed and his family were in the area in December and early January. He gave a report of the Guadalajara work at the monthly missionary meeting in West Richmond on January 10. John McCann (Brazil) paid an appreciated visit to the city in January, giving a report in Victoria Drive of the Lord’s work, and was guest of the Fairview assembly for ministry on Sunday and Monday before leaving for the midwestern US. Gander: From November 3-21, the assembly held a gospel series with Bryan Joyce and Larry Perkins. The meetings were well attended with a number of people coming out for the first time, which was a great encouragement to the believers. There was blessing in the final week as a teenage son of one of the assembly couples was saved after the gospel meeting. On December 21, the annual Sunday school Christmas program was held at the hall with over 80 people attending. On December 31, Marvin Derksen and a local brother had fitting words of ministry to end the year and start a new one. North Bay: Please pray for gospel meetings in Nipissing Junction to commence on April 19 with Gaius Goff and Stephen Vance. Toronto: The Langstaff assembly had a Winter Community Outreach weekend on January 24-25 with supper served in the basement of the hall both evenings, and a one-hour gospel meeting following the supper. The believers were all encouraged to focus diligently on getting as many of their contacts as possible out to hear the gospel. Calendars and invitations were also distributed in the neighborhood around the hall. Over the two nights, more than fifty visitors heard the gospel preached. Michael Da Silva, Jr., and Bryan Joyce spoke on Saturday evening. Samuel Moore and Andrew Ussher spoke on Sunday evening. The assembly is encouraged with the response to this effort, and is now praying earnestly for blessing in salvation. Montreal: The believers of Grace Gospel Hall, Pincourt, would like to thank you for your prayers, and the Lord’s answers, for the reconstruction of the hall following the fire of July 4, 2013. Despite many difficulties and delays, the hall is now rebuilt, with just a few things left to be completed inside. It is anticipated that within a few weeks, Lord willing, meetings will be held in the new building. Meeting times will revert to: Breaking of Bread 9:30am, Sunday school & Bible Study 11:15am, Gospel/Ministry 7pm (preceded by prayer) and Prayer Meeting on Wednesday at 7:30pm. Buckeye: Please pray for gospel meetings which began February 15 with John Fitzpatrick and Matthew Van der Hart (Orangewood) in the Chamber of Commerce Building. Seed Sower distribution was scheduled for Saturday, February 14. Phoenix: Noé Rodriguez, Shad Sluiter, and John Dennison commenced gospel meetings in the West Phoenix hall on January 25. The third conference in the new hall at Orangewood went well this year, with a number of visitors attending. The Word was opened by 10 of the Lord’s servants, and Tom Baker and Marv Derksen led two profitable Bible Readings. An interesting and challenging missionary report of the work in Brazil was given by John McCann, Jr. Dan Harvey and John Clingen spoke to the young people on Friday and Saturday evenings after gospel meetings. A happy spirit prevailed during the weekend. Chico: The assembly was encouraged with two weeks of gospel meetings with Joel Portman and Jerry Jennings in November. There were visitors every night, and the saints were encouraged, as the seed was faithfully sown. Also in January, Sandy Higgins led four nights of Bible Readings on the “Servant Songs in Isaiah.” The readings were Christ-extolling and refreshing to the saints. Stout: Roy Weber and Eric McCullough commenced gospel meetings on January 18. Saugus: The assembly had the joyful privilege of seeing four young believers obey the Lord in baptism. There were a good number present, including many unsaved. Jonathan Procopio gave ministry on baptism, followed by a message in the gospel. The work at the rehab center continues, as it has for the past nine years. We are thankful for the opportunity that the Lord has provided. Deckerville: Bill Metcalf gave good, solid ministry for the saints in January. Saginaw: Jack Nesbitt and Fred Krauss encouraged the saints in ministry at the February 1st bimonthly ministry meeting. The meetings were shortened by a snowstorm. However, the day ended with a solemn gospel meeting. Brother Krauss continued with ministry meetings in Saginaw on February 2-3, and in Cass City on February 4. Fridley: Two more souls have professed faith in Christ during a January series of gospel meetings in Sauk Rapids with Robert Orr and Jerry Jennings preaching. Kansas City: Larry Buote shared with the saints the study of Solomon’s Temple from January 28 through February 2. It was both informative and encouraging. Blue River: On February 1, Isaiah Frazier, John McCann, and Joel Portman spoke at the all-day meeting. John McCann gave ministry and was also in Mt. Sterling on February 2. Jacksonport: Christians gathered unto the name of the Lord Jesus Christ (Egg Harbor) are pleased to announce they are now meeting in the Gospel Hall in Jacksonport, and no longer meet at the Bertschinger Center in Egg Harbor. With God supplying the need through assemblies, foundations, and individuals, from both the USA and Canada, the new gospel hall was opened, debt free, on January 18, 2015. Heartfelt thanks goes to all for their prayers and support. Given the interest we have seen in the gospel hall from the community, we plan, in the Lord’s will, to hold a series of gospel meetings in February. Your continued prayers are appreciated, and visitors are welcome. The address is 6333 State Highway 57, Sturgeon Bay, WI 54235. Contact: Tom Moeller, Tel: 920-743-8618. La Crosse: Joel Portman gave ministry here, February 2-4. Waukesha: In early January, the saints enjoyed a very profitable week of ministry by William Skates on the subject of “Challenges in Today’s World,” illustrated by various characters from the book of Judges. Ciudad Netzahualcoyotl: The annual Sunday school program was held on January 18, with the “I AM” statements of the Lord Jesus being the theme. The gospel was presented to the more than 120 people present. Hermosillo: The believers enjoyed a visit from Miguel Mosquera, of Portage la Prairie, MB in January, where he gave help in both ministry and gospel. God willing, gospel meetings commence on February 22 with John Dennison and Marcus Cain. Ciudad Obregón: The believers in the assembly are thankful for the help of several brethren from the USA and Canada who are helping with the wiring, plumbing, and drywall work in the new hall. Ciudad Delicias: Gilberto Torrens and Anderson Hernandez preached the gospel six nights a week for three weeks in this new work. It was encouraging to see several new people under the sound of the gospel, with some attending frequently, including a man in his 80’s. Guasave: Leonel Chávez and John Dennison preached the gospel nightly from December 28-January 25. This series followed the Seed Sower distribution, and it was encouraging to see many new people in the hall. Some attended regularly, and God saved souls. The last night of the series, three believers obeyed the Lord in baptism. Please continue to pray for the work here, and for the eventual formation of an assembly. Tepic: Marcus Cain and Jairo Gracia (Hermosillo) visited early in January. Jairo preached the gospel and Marcus took up truths from the first two chapters of 1 Peter. Santiago Ixcuintla: The believers were happy to have James and Nelly Dyck for a brief visit in January. James and Jesse Klein preached the gospel with excellent interest and attendance. Cancún: The believers enjoyed Abe and Hazel Dyck’s visit on January 18, when he shared in ministry and gospel, ably translated by Timothy Turkington. Samuel Simonyi-Gindele writes, “As we look back over the months of 2014 since our move to Angola, we are deeply impressed with the faithfulness of God’s provision through His people. Various needs and challenges have been supplied in such a timely fashion that there can be no doubt that it is the ‘God of faithfulness’ (Deut 32:4, ESV) acting on our behalf. In the assembly here in Biula, we have been having a weekly teaching meeting early on Saturday mornings, systematically going through the early chapters of Genesis. Very basic truth about who God is, where Satan came from, how the Scriptures were inspired and recorded, and the story of creation and the fall of man have been presented in as simple a manner as possible, in order to try and establish a firm foundation for further teaching from Scripture. It has been an opportunity to learn what the believers here know and understand, and to address basic misunderstandings, such as the fact that Satan is not all knowing and omnipresent, as only God is. Notes are made every week in Portuguese and Chokwe, but only a few of the dozen ladies who come can read, and many of the men and teenage boys read very haltingly. The truths are often easy to explain in this context. For example, when speaking of Genesis 3:15, the people know about killing snakes, that one has to hit it on the head, and, as I have seen on occasion, to confirm the snake is finished, the head is stepped on and ground underfoot, but not without risk of being bitten! So, to illustrate the difference between what is meant by the promised One bruising the serpent’s head (utterly destroying Satan’s authority and power), but having his heal bruised (the cost to Christ at Calvary and His victory in resurrection) is not so difficult, as the believers relate to experience, and not imagination. It is remarkable to notice that God made this promise of the Libertador as we say in Portuguese, before He pronounced sentence on Adam and Eve for their sin. What proof of God’s grace! Clive Barber and Bryan Stewart have been encouraged by a good interest and blessing in salvation, both in South Australia and Tasmania. Bryan formerly came from Magherafelt, Northern Ireland, and was recently commended to the work of the Lord. Prior to the New Year, Clive and Bryan had an encouraging series of gospel meetings with blessing in Strathalbyn, South Australia, where there is no assembly. March 14-15, in the North Tampa Gospel Hall, 12704 Marjory Ave., Tampa, FL. Saturday: Ministry 2pm, Gospel 6:30pm. Lord’s Day: Breaking of Bread 10am, Ministry 2pm, Gospel 6:30pm. Contact: Edward Armstrong. Tel: 727 785-5998, E-mail: edwardarmstrong3@gmail.com; or Joe Procopio, E-mail: joejanpro@verizon.net. April 3-5, in Le Parc Conference Centre, 8432 Leslie St., Thornhill. Meetings on Friday and Saturday at 10am, 1.30, 3:45 and 7pm. Lord’s Day: meetings at 2:15, 4 and 7pm. Prayer meeting on Thursday, April 2 at 7:30pm in Langstaff Gospel Hall, 1300 Langstaff Rd. Expected speakers: Crawford Brown, Marvin Derksen, David Gilliland, Eugene Higgins, David Petterson, and Kyle Wilson. Corr. Ian Margerison, 3 Hill Top Trail, Stouffville, ON, L4A 7X4, Tel: 647 291-8831, E-mail ijmargerison@gmail.com, and Randy Marisette, 30 Fieldview Cres., Markham, ON, L3R 3H7, Tel: 905 475-7919, E-mail: marisettes@hotmail.com. April 3-5, with prayer on Thursday, April 2 at 8pm in the South Main Gospel Hall. All other meetings in the South Burnaby Secondary School. Emphasis in the morning sessions on Friday and Saturday (10:30am) will be on evangelism, with ministry and reports. David Weir of Romania is expected. Each evening, there will be a gospel meeting. Contact Earl Ritchie at earlrit@aol.com for more information. April 11-12, commencing with Prayer Meeting on Friday, April 10, at 7:30pm. Ministry begins on Saturday at 10am. Lord’s Day: Bible Reading 9am (John 20:19-31), Breaking of Bread 10:30am. All meetings in the Gospel Hall. Corr. Gary DeGroote, 28073 West Brook St. New Hartford, IA 50660, Tel: 319 983-2713, Cell: 319 231-4132; E-mail: gdegroote2@msn.com; Gospel Hall: 319 346-1153. 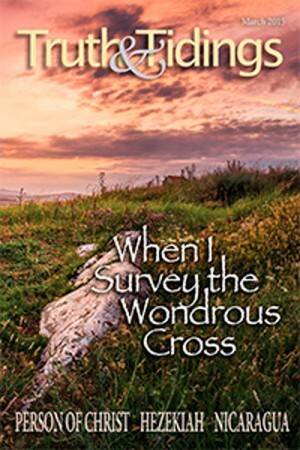 April 18 – 19, with Prayer Meeting on Friday, April 17, at 7:30 pm in the Waterloo Gospel Hall, 726 Western Ave., Waterloo. All other meetings are in the Cedar Falls High School, 1015 Division St. Cedar Falls. Saturday: Ministry 10am. Lord’s Day: Bible Reading 9am (John 17), Breaking of Bread 10:15am. Corr: For Waterloo – Delmer Stickfort, 317 N. 3rd St. Raymond, IA 50667; Tel 319 235-7452. For Cedar Falls, Mike Palmer, 18502 X Ave., Dike IA 50624; Tel: 319-989-0869; E-mail: mjpalmer89@gmail.com. Four nights of Bible Studies between the conferences, shared jointly with Stout & CF/Waterloo, are planned. Bible Studies 7pm nightly as follows: April 13-14 (1Cor 11, 12) – Cedar Falls Gospel Hall; April 15-16 (1Cor 13, 14) – Stout Gospel Hall. April 25-26, in the Waukesha Gospel Hall, 2641 Pebble Valley Road, Waukesha, WI. Friday: Prayer 7pm, Saturday: Ministry 10am and 2pm, Gospel 6:30pm. Lord’s Day: Breaking of Bread 10:30am, Ministry 2pm. Contacts: John Orr, Tel: 262 642-3093, E-mail: j.c.orr@earthlink.net; or Stephen Moffitt, Tel: 262 650-9190, E- mail: stephenmoffitt@earthlink.net. For maps and more information: waukeshagospelhall.org. May 3, in the Newmarket Gospel Hall. Breaking of Bread 9:30am, Bible Study 11:30am (1Cor 1:20-34), Ministry 2pm, Gospel 6:30pm. For directions, accommodations contact Tim Scheer, Tel: 905 898-4369, E-mail: tescheer@netzero.com. May 16-17, with Prayer Meeting Friday, the 15th at 7:30 in the Cumberland Gospel Hall, (700 E. First St.). All other meetings at South Penn Elem. School, (500 E. Second St.). First meeting Saturday 10am. Breaking of Bread Lord’s Day at 10am. For accommodations, directions, or local hotel numbers for those wishing to make their own arrangements, contact Harold Harrison, Tel: 301 689-2432; or Tim Harrison, Tel: 301 689-0152; E-mail: sonnyh60@aol.com. May 16-17, in the Richelieu-Vanier Community Centre, 300 Des Pères-Blancs, Ottawa, Tel: 613 580-2424. Prayer meeting at the Gospel Hall, Friday, May 15 at 7:30pm; Saturday: Prayer/Ministry 10am and 2pm, Gospel 7pm. Lord’s Day: Bible Reading 9am, Breaking of Bread 10:30am, Open Sunday school 1pm, Prayer/Ministry 2:30pm, Gospel 7pm. Subject of the Bible reading is 1 John 1. To help in planning meals and accommodations, if possible, please contact Colin Meaklim, Tel: 613 730-7410; E-mail: meaklim@primus.ca. Palm Springs, CA – Conferences cancelled until further notice. Fredericton, NB – April 25-26 – Cancelled due to hall renovation. Bryn Mawr/Hatboro, PA – November 6-8, 2015. Newington, CT – October 31-November 1, 2015. Alex Dryburgh: New phone number is 519 633-6880. Mrs. Sadie Noble: c/o Halliday, 4 Eastview Place, New Hamburg, ON, N3A 2G5. Tel: 519-390-0123. E-mail remains the same. Wendell Earl Cutcliffe of Crapaud, PE, on March 27, 2014, age 76. Saved while alone in his bedroom on June 25, 1956, following a gospel effort by Bert Joyce and Robert McIlwaine. The family well remembers his voice ringing out with the hymn, “My Jesus has done all things well.” Shortly thereafter, he was baptized and received to the fellowship of the Crapaud assembly, where he remained for over 57 years until his homecall. Never married, he along with his mother Janet Cutcliffe, was a “succorer of many” in their shared home in Cape Traverse, where saint and sinner were welcomed with Christ-like care. Although a quiet man, Wendell took an active part in the construction of the new Hall in Crapaud in 2013, and the Lord graciously allowed him to see the new building erected. His funeral was shared by his nephew, Neil Thompson and friend, Grant Thomas, elders of the Crapaud assembly. Left to await that glorious reunion are his siblings Bea (Doug) Patterson, Lois Thompson, Liz Flack, Lynda (Sheldon) Gardiner, Donna Livingstone and Alger (Liz) Cutcliffe. He was predeceased by siblings Adele MacLean, Eleanor, Gerald, Gordon, and Byron. Mary Elizabeth Seymour (nee Hunt) of Collingwood, ON, on November 1, 2014, age 87. Mary was saved at a young age and married to her beloved Stanley. They were both very active in the Collingwood assembly for over 60 years. Mary was out to every meeting unless very sick. She had a long prayer list that was prayed over every day. Her son Berkley phoned her one day from Saskatchewan, and she asked him to call back because she was in the middle of praying for all on the list. Mary had the gift of hospitality, always welcoming preachers and their wives, friends, and family into her home. Mission work was her passion; her basement was always full of boxes for Africa and Ukraine. She was a dear, faithful lady, much loved by all. The Lord blessed her by saving her children and grandchildren. Her warm personality and love for others is sadly missed. Harold Dale of Unionville, ON, on December 30, 2014, in his 93rd year, at Bethany Lodge. The death of his friend on the beaches of Dieppe and an accident in military training resulted in Harold being sent home from Europe, concerned about his soul. Shortly after returning to Canada he trusted Christ. He lived a consistent Christian life and was in fellowship in Toronto area assemblies. Predeceased by his wife Doreen, Harold will be greatly missed by four daughters, four sons, a number of grandchildren, and great-grandchildren. The assemblies Harold was associated with in the Toronto area have lost a faithful brother. Two sons, Norman and Ronald, spoke commendably of the influence of their father’s life in their salvation. Cyril Lallion, an elder in the Broadview assembly, also spoke well of Harold. Larry Steers spoke at the funeral service and also at the grave. Debora Prough of Akron, OH, on January 3, age 42. She was saved as a girl while attending gospel meetings conducted by W. Lavery and E. McCullough, baptized, and received into the assembly fellowship. Debbie was active in Sunday school work, and loved the Lord and His people. She is survived by her husband, Eric, and two teenage daughters, and will be greatly missed. Timothy Webb reflected on Debbie’s life, Bill Seale presented a clear gospel message with words of comfort to the large gathering, and David Petterson closed the graveside service with prayer. It is only till He come. Helen Mae Mann (nee Stone) of Collingwood, ON, on January 6, age 79. Born June 30, 1935, Helen was born and raised in the Victoria Road area where her family attended the assembly with her two brothers, Ken and Arnold. Saved as a young girl, she became a nurse and married Laird. Happily married for over 50 years, they raised two children, Bryan and Lyn Ellen, and were in happy fellowship at Victoria Road for many years. As they aged and their health failed, they moved to Wasaga Beach to be near their son Bryan, there faithfully attending at the Collingwood assembly. Helen began suffering mini-strokes, and then in the fall of 2014, she sustained a severe stroke. Her pleasant smile and laugh, and her faithfulness to the meetings will be sadly missed. Funeral Service was taken by Ed Miller and Lorne Langfield. Doris Madeline Cummings of Blues Mills, Cape Breton, NS, on January 12, 2015, age 86. Doris was born again in 1948 and had been a part of the assembly in Blues Mills since July 4, 1954 when four couples first sat down to remember the Lord. She was the last founding member of the assembly, and there is little doubt that one of her greatest desires in her final years in the hospital was to be back gathered with the people of God in Blues Mills. Surviving are her five daughters and three sons; 23 grandchildren, and 25 great-grandchildren, many of whom are not saved. Doris was predeceased by her husband, Gordon. The funeral was held at the gospel hall, with Ian MacLennan responsible for the eulogy and John Bain having a word in the gospel. Her son-in-law, Oliver MacKinnon, had a touching word at the graveside. Please pray for the family.